Back in the early thirties, ambulance coverage in Central Jersey was minimal. Several Milltown residents saw this as a problem for their humble community and decided to fix it. 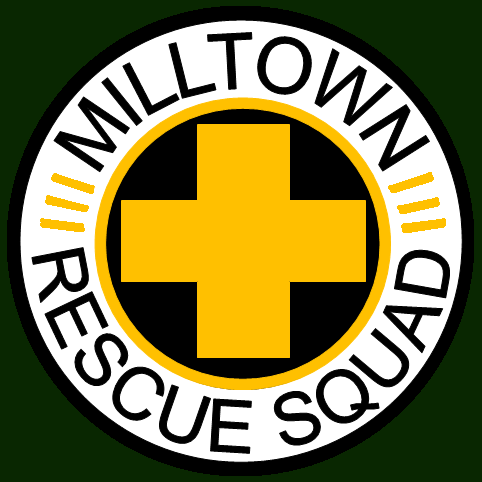 On October 22, 1937, their solution was incorporated into the town as the Milltown Rescue Squad. Nineteen men’s dream had now become a reality. For the first few months of service, squad members responded without an ambulance, and had to rely on one to respond from out of town while the squad members rendered aid until its arrival. In August of 1937, our first ambulance was purchased, a Nash model which was offered from Toms River. The ambulance was a great addition to the organization but it was aged and had already seen seven years of service with another agency. Over the next two years, the squad vigorously rose the funds to buy an ambulance that would be fresh off the assembly line and in 1939, they succeeded and bough a Eureka/LaSalle Ambulance. For ten years this ambulance responded across the county from an old freight station located behind Jensen’s Garage on Main Street, which would eventually house our first “permanent” headquarters. While the plans for the building, which would be worked on by the members themselves, were drawn up only a few years after the squad was established, the construction was disrupted by World War II. After the war, in 1947, the building was finally erected on Washington Ave, by materials donated from local businesses and for ten years, this building housed multiple vehicles, and was big enough for large community events. In addition to this building the squad also purchased a 1937 Dodge panel truck from the Trenton Tobacco Company, and was retrofitted to become a rescue truck. The truck was redesigned and constructed by the squad members. In 1950 the squad purchased a second ambulance to add to the fleet, making the squad capable of answering two calls simultaneously. The Sayre & Scottville/Cadillac Ambulance ran with the LaSalle until it was replaced in 1954 by a Miller-Meteor/Cadillac Ambulance. Also around this time, the current headquarters became too financially burdensome for the squad to maintain, and this mean they would eventually have to sell the building to stay afloat. An agreement was made, and the building was sold to the Borough of Milltown in exchange for a piece of land on South Main Street, where there current building stands. That headquarters was built and dedicated to charter member George Moetz in 1956. Moetz gave his life serving his country in World War II, and was a dedicated squad member since the squad’s inception. The old building served as the Borough Hall for many years. It was ultimately demolished inorder to build the current Borough Hall and Police Station in the early nineties. Two years later, the squad replaced the 1950 Caddy with another one. The squad was running three vehicles strong, and their reputation began to grow with their membership. In 1957, this membership grew to include the teenagers of Milltown. The Junior Members were incorporated into the squad and these original juniors continued to serve the squad for 30 plus years. In fact, original junior Thomas Goodwin, Jr. still serves as an active member 57 years later. To finish out the decade, the squad purchased a “real” rescue truck from Allegheny which was mounted on a Chevy chassis. This took over for the now aging dodge, and responded to emergencies across New Jersey in its thirty years of service. The 1960’s proved to be an exciting time for the squad. The squad saw dramatic growth across their service area, as an update in their fleet. All the 1950’s ambulances were eventually replaced with matching Superior/Cadillac ambulances and the rescue truck was re-chassied on a 1968 Chevy which could handle greater weight from the body. Also, new advances in technology allowed the squad to better equip the truck with rescue and extrication tools. During the seventies, the squad continued to run strong. With each call, the squad’s experience grew and that knowledge continued to get passed down from the older members to the newer ones. The education that the squad provided based on their training and experience was a valuable assets to the organization. During the early seventies, new standards for first aid care were unveiled and a state regulating training program began to surface. Along with the training came a new title, First Aiders were now becoming Emergency Medical Technicians. EMTs as they were referred to, were trained to provide care in both medical and trauma emergencies. While many other squads were skeptical of the program, the Milltown Squad sent many members to through the training program, and the outcome was a success. Members who underwent to program took notice that many of the skills being taught was already practices by the squad members for years, as well as some new techniques that made continued to improve the already first class patient care that the squad had rendered since 1937. During the decade the squad continued to run with the Cadillac ambulances and was content with their design, however new regulations made the Caddy style obsolete and when the squad went to replace them they had to find alternatives. The decision was to buy a 1978 Ford F350/Swab ambulance. What made it different was that the ambulance has a modular box design in the back, which allowed for both interior and exterior storage, as well as a bigger patient compartment and room for more EMTs in the back. What also gave the new vehicle an advantage was its ability to have the truck chassis replaced with a new model whenever the old one became obsolete, without having to buy a completely new ambulance. The eighties were an exciting time for the squad. The squad bought a matching Swab ambulance in 1981, but chose to have the box mounted on a Chevrolet instead of a Ford. The two ambulances served proudly and were great additions to the organization. EMT training had also become more mainstream, and most members at this point were fully certified Emergency Medical Technicians, some were even EMTs as juniors. In addition to EMTs, Middlesex General Hospital unveiled its Mobile Intensive Care Unit program, which provided paramedics for a majority of Middlesex County, including Milltown. Paramedics are trained above and beyond the EMT level and their ability to administer medications via IVs and other invasive methods allowed the squad to provide a better patient care experience. Paramedics run alongside the squad and respond to life threatening situations such as Heart Attacks and Strokes, and with the squads help, administered vital lifesaving care that used to only be accessible in hospitals. The squad began planning for its 50th year of service. The organization hosted a parade to celebrate as well as a party in the borough park. In addition to the Swab ambulances, the squad bought a new rescue truck. The truck was designed by the membership and submitted to the Salisbury Company where the rescue body was build and was mounted on a Peterbilt. 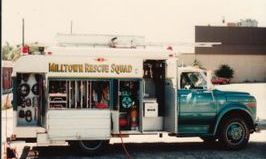 The truck was purchased in 1985 and placed in service as ‘Rescue 39’ and continues to serve Milltown 25 years later. Later in the decade Ambulance ‘31’ was rechassied on a newer model. The last decade of the century, the nineties, saw the growth of the squads fleet as well as their building. Rescue 39 was currently being housed in a makeshift garage in the rear of the building due to the small size of the original bays compared to the long and high body of the truck. The squad began planning for an addition to the building to include a new bay for the Rescue, a second floor to contain bunk rooms, offices, and a new meeting room. The construction began in 1995 and was quickly finished so the Truck could move in. In 1993, we purchased a new ambulance that was bigger and better than the Swabs. The rig, which was deemed ‘37’, was a 1993 Ford F-350 XLT/Lifeline, which included an on board generator, scene lighting, and a bigger patient compartment. The ambulances also gained a new but valuable piece of equipment, Automated External Defibrillators. AEDs allowed the squad to provide rapid live saving intervention in otherwise deadly cardiac emergencies which in the past would have had to be administered by MICU Paramedics or the Emergency Department of a Hospital. The AEDs saved and continue to save countless lives, which otherwise would have come to an abrupt and tragic ending. 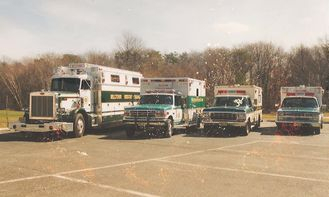 Also in 1998 the squad replaced the Ford/Swab with a 1993 Ford F350/Horton Ambulance which had previously seen service with a company on Long Island. This ambulance, numbered ‘34’, served the community until 2013 when it was replaced by a newer model. During this decade the squad had responded to numerous emergencies both in town and out of town. Most notably the Durham Woods Explosion in Edison, the Refinery Fire in Woodbridge, a Bus Accident on the Turnpike, and the Hazmat Spill in South Amboy on Route 35. The past ten years have been very busy for the squad. The organization replaced the last Swab ambulance with a 1994 International 4700/Horton Ambulance, deemed "31". This ambulance was the biggest one in use by the squad and made the big Fords feel small. The squad also responded to many more calls, and was averaging close to 1300 calls per year. The squad also responded to New York City in the wake of the September 11th attacks. The squad sent an ambulance to ground zero for two days and was vital in the rescue efforts of that tragic day. The events of that day can still be recalled vividly by members who responded. It was very a trying time for us, as well as the entire country. None the less, the squad continued on. We purchased a new vehicle in 2004 to replace the Ford/Lifeline, a 2000 Freightliner FL50/Horton, which serves as both an ambulance and a “mini” rescue truck, since it carries extrication tools, popularly referred to as the Jaws of Life. Our fleet also evolved from the traditional ambulances and rescue truck. We operate a Bobcat that has a custom build ambulance compartment in the bed of the vehicle, which is used to operate in areas that ambulances cannot go, as well as during large events such as the Fourth of July fireworks and Middlesex County Fair. We also took a Wells Cargo Trailer in 2008 and custom fitted it to be a rehabilitation area for firefighter and other first responders during large scale events such as structure fires. The trailer is also used as a first aid station during large events such as the fireworks and county fair. In 2012, the squad replaced Ambulance 34, which was a 1993 Ford F-350 with a new 2012 Ford F-450 4x4 build by Horton Emergency Vehicles. The ambulance was specked out by the squad and VCI with custom features that would be beneficial to the squad's use of the new rig. The ambulance was delivered in December of 2012 and put into service a month later. The new rig "35" will serve many years with the squad and will allow us to respond with the newest and safest equipment available. In 2013, the rescue squad was contacted by the Middlesex County Urban Search & Rescue (USAR) team to provide medical support functions during both training and emergency deployments. After two years of this servce, the Milltown Rescue Squad was officially recongized as the sole provider of Emergency Medical Services to the Middlesex County USAR team, and with it begins an exciting new chapter in the rescue squad's history. The last 80 years has been a very exciting experience for the squad. We have seen many members and vehicles, and have learned so much over from ourselves and others. While there has been all this change, one thing has remained the same, we have been 100% volunteer, 24 hours a day, 7 days a week. This is a very big accomplishment since even though we are not paid, our professionalism is no different that out career counterparts that many towns now hire due to lack of volunteer EMTs. We hope that the citizens of Milltown continue to support us in the coming years as we have been there to support them for the last 80 and are as proud of us as we are as we celebrate our 75th anniversary. Thank you for taking the time to read our history and browse our website. 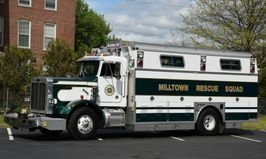 We hope you know that in your time of need, the Milltown Rescue Squad will be there as we have since October 22, 1937. An overview of the many places we have called home! In a shed behing Jensen's Garage was where the first ambulance was kept. This converted freight station would serve as home while members worked towards a more permanent headquarters. This new building sat high up on the hill of Washington Avenue. While the building was well equipped, it served as too much to maintain and was sold to the borough. It served as Borough Hall until 1994 when it was raised. The original base of our current station, this building was erected at the center of town and was dedicated to charter member George Moetz who was KIA during WWII. The addition for our Rescue Truck Bay and Upstairs was build in 1995 but the second floor served vacant for many years until members were able to finish the inside. Now the extra space allows for offices, bunks and a meeting room for training and other business. Originally a delivery truck, this vehicle was bought and converted to serve the needs of the Rescue Squad. A custom truck was purchased to replace the aging and outsized Dodge. This was delivered in time to begin serving the fast paced New Jersey Turnpike. In order to accommodate the growing demand for new and improved equipment, the body had several compartments added to the rear as well as a newer and more durable chassis placed to carry to box. With the Chevy nearing the end of its practical and useful life, the squad looked to a much larger and stronger vehicle. This heavy rescue, the first in the county, was designed to serve the current needs of the members as well as the future needs of the organization. It sill runs strong over 30 years later! IF YOU HAVE AN EMERGENCY DIAL 911!! !